There is a saying that every artist, no matter what his or her medium, has the one true masterpiece in their soul that they were born to create and share with the world. 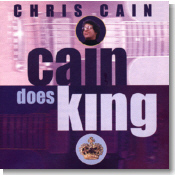 If that saying holds true, then San Francisco Bay area guitarist Chris Cain has given the world his Mona Lisa with Cain Does King (Blue Rock'It Records). The past few years has seen a deluge of tribute albums being released for various artists, with most being mediocre at best and very few being as noteworthy as this one. The King being paid tribute here is none other than the grand ambassador of the blues, Mr. B.B. King, with the 12 tracks on this album paying homage to the master at whose feet Cain studied. Cain and producer/drummer Patrick Ford chose the tunes for this labor of love from King's catalog from the 50s to the 70s, carefully avoiding such signature pieces as "The Thrill Is Gone," "Caldonia" or "How Blue Can You Get." They instead selected numbers that are King classics but not quite as commercially known as the aforementioned tunes. Cain's guitar work has never sounded more inspired than it does on this outing, picking out stingingly clean solos the likes of which can be heard on "Gamblers Blues," alongside succulent runs up and down the fretboard as is prevelant on "You Better Not Look Down." Cain's vocals have always contained a certain B.B. King-type of quality and tone to them, but at times he sounds eeriely like the master himself on a couple of tunes here, especially "Whole Lotta Lovin" and "I'm Going Home." The lone instrumental selection, "House Rocker," has Cain and keyboardist David K. Mathews trading off some wicked solos, and is followed by the album's two best numbers, "Lookin The World Over" and "So Excited," a tune which really showcases Chris' astonishing guitar work. Backing Cain, besides Ford and Mathews, is Dewayne Pate on bass, Mic Gillette handles both trumpet and trombone, Skip Mesquite honks out the sax lines and Mz Dee (Dejuana Long) sings backup. Chris Cain consistently turns out a terrific product, and Cain Does King is his best work to date. To say I was pleasantly surprised with this album would be a gross understatement ... I was knocked for a loop at how exceptional it is. This is one of those albums that just plain makes you feel good with every listen.